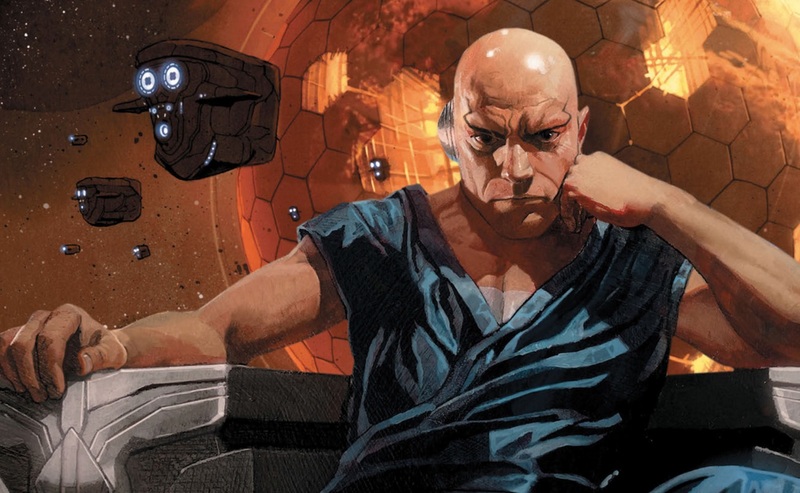 The Metabaron: Book 1 Review – AiPT! If you’re not familiar with The Metabarons, newcomers should know that it is an epic space opera with a robust science fiction mythology. The series first appeared in 1981 and continued all the way through 2003 off and on. It’s back, but is it as good as the previous volumes, and can it be enjoyed going in blind? Alexandro Jodorowsky is a visionary in more ways than one (he even has a documentary about him) and he’s been producing very robust science fiction epics for decades. He also always seem to find picturesque artists who can bring a visually stimulating style to his scripts. This book is no different as Valentin Sécher somehow manages to create incredibly vivid and realistic art in every single panel. The biggest surprise with this first volume was how accessible it was. I’ve dabbled with The Metabarons series, but haven’t read them in quite a few years; even still I quickly found myself drawn to this story and the adventure within. That’s partly due to strong introductions for the Metabaron and the two main villains of this book. The story kicks off with the Metabaron requiring fuel, which leads him to a planet that is tied to his history — and from there the bad guys find reasons to plot against him. The story isn’t a conventional three act structure, which makes the narrative an interesting one. Jodorowsky and co-writer Jerry Frissen focus on the Metabaron, a Techno-Pope (a fat leader of the Techno-Techno civilization), and Wilhelm-100 (a muscle-clad villain with huge arms and a slave who keeps his addiction at bay) and doesn’t mind shifting focus on any one for extended periods. The beauty of the book is how the writers draw you into each of these characters even though the Metabaron is the hero of the book. As the story flows each of the trio gets things to do, tasks to accomplish, and ultimately desires that crush them in the end. The Techno-Pope gets less play than the other two, but he gets just enough narrative to set him up for the next volume. The bad guy is kinda mental. The Metabaron: Book 1: The Techno-Admiral & The Anti-Baron really is a space opera in more ways than one and it’s obvious Dune and the wild worldbuilding required for that tale were inspiration for the creation of this tale here. There are plenty of strange new words invented and thrown around (as ifwe’re supposed to know what they mean) which helps make this world feel foreign and strange. The Metabaron is the quintessential superhero protector who has vowed to never kill again though plenty want him dead; he’s basically the best fighter in the universe, but also indestructible. He has plenty of romantic ideals – displayed in well written captions – and the there’s plenty to chew on as the story progresses. One of the biggest draws to this book is its oversized format; that’s because the art deserves to be blown up. There’s so much detail and gorgeous coloring to look at and every panel is deserving of just a little more time than usual. Faces, especially Wilhelm-100, are incredibly dramatic and the lighting gorgeous. Outer space is just as pretty with a lot more color than you might expect. The action is easy to follow even when a single panel is more a painting than a comic book drawing. It all comes together to make The Metabaron: Book 1 a vividly real and genuine visual experience. The language in the book can be a bit much (Techno-Techno civilization really?) and at times gets in the way of the flow of the narrative. Confusing is fine at times, but you get the sense that Jodorowsky spent a lot of time trying to make it sound fancy and technical which becomes silly or at times just distracting. The book also takes time to get going. While the introductions are good, the bad guys very easily shown as the baddest of the bad, the actual plot takes a while to get into gear. There’s a lot of complexity and character motivations to sift through, but it would have been a page turning experience from the get go if the point of it all was made earlier on. It doesn’t help that the Metabaron basically takes a long nap for a portion of the book so the bad guys can get their ducks in a row. So gorgeous it might as well be concept art for a movie. The Metabaron: Book 1 isn’t just good, it’s memorable. The imagery will stick with you, the complex world will make you ponder its depths, and the mythical nature of the hero has deep roots worth exploring. It might turn some away due to its slow start and crazy use of language, but if you give it a chance you’ll be hooked.